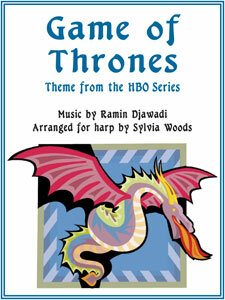 Sylvia Woods has arranged Ramin Djawadi's dramatic theme from the HBO series Game of Thrones for advanced beginner to intermediate harp players. She has created two arrangements, and both are included in this sheet music. #1. The first version is for harps with 2 octaves below middle C. The range is 30 strings from D up to E.
#2. The second version is for smaller harps with 1 octave below middle C, requiring 23 strings D up to E.
Both arrangements are in the key of G (1 sharp), and need a G# lever change. If you don't have the required G lever, or you prefer to play without having to change levers, you can omit measures 5 through 8. Each arrangement is 4 pages long, for a total of 8 pages of music. Fingerings and chord symbols are included.